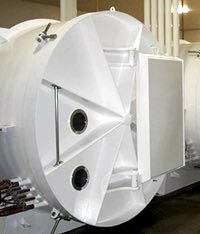 The new BDRY dry screw vacuum pumps are widely used in a variety of sectors worldwide. The structure is not feasible to drain of liquid that is inappropriate for liquid processing. Condensation occurs inside the pump. pump and could cause overload trip. Prevent condensation of corrosive vapor by the gas ballast. may cause frequent seal damage. The oil temperature inside gear box shall be risen. It may makes oil leak and change of oil performance. No extra cooling gas required. Maintains low temperature by step-by-step compression. 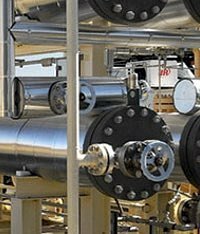 Heat exchanger for cooling of circulation gas is required. Additional equipment and maintenance cost increases. If the cooling gas filter clogged, the pumps is seizured. 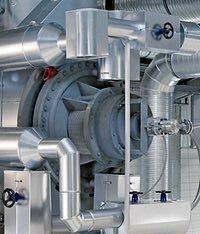 (1) Smooth emission Structure: Screw Vacuum Pump have an inherent disadvantage when it comes to draining and flushing. The exhaust port is small and is not at the lowest point in the Vacuum Pump so liquid will not drain out of the Vacuum Pump. But, the exhaust port of BDRY Vacuum Pump is big and is at the lowest point in the Vacuum Pump so liquid will drain out of the Vacuum Pump smoothly. 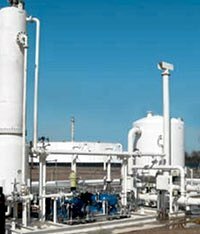 (2) Gas ballast: The basic principle of ballast is that Non-condensable gas (N2 or air) is admitted into a pump during the gas compression stages. This increases the percentage of non-condensable gas such that the partial pressure of the vapor being pumped is below its saturated vapor pressure. (3) Gear Oil Coolant Jacket: The lubricant oil in the gear box is cooled by a cooling water jacket. Application: Monoglycerides, Vegetable oils, Fatty acids, Vitamin A, Vitamin E, Esters, Chlorinated, Hydrocarbons, Silicon oils, Polyglycols, Macro-paraffins, Phthalates, Sebacates, Fragrances, Pharmaceuticals,Essences, Pyrethrum, Insecticides. 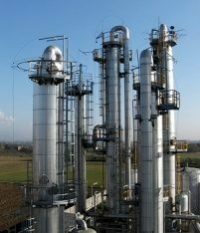 Market: Distillation Plant, Chemical Processors, Vegetable Oil Producers, Pharmaceutical Companies, Reclaimers. Vacuum System: Inlet Condenser, Catch Pot (Knock-Out Pot), Inlet Isolation Valve, Outlet Condenser, Stainless Steel Piping. Application: Pharmaceutical intermediates, Heat sensitive pharmaceuticals, Food, Water desalination, Liquid effluent, Black liquor concentration in paper and pulp industry, Concentration of sugar cane and sugar beet juices, Ammonium nitrate, Sodium hydroxide, Phosphoric acid, Recovery of plating and photographic solutions, Concentration of radioactive waste. General chemical laboratories, Food producers, Sugar and salt industries, Pup and paper industries, Large plating and photographic workshops, Nuclear waste reprocessing facilities, Waste disposal companies. Market: Pharmaceutical manufacturers, Fine chemical industries, General chemical and petrochemical industry, Fragrance manufacturers, Paint and glue manufacturers, Resin and plastics industry. Vacuum System: Inlet Condenser , Catch Pot(Knock-Out Pot), Inlet Filter, Inlet Isolation Valve, Outlet Condenser, Gas Ballast, Stainless Steel Piping. Application: Pharmaceutical products and their intermediates, Food products including soups and beverages, Fine chemicals, Dyes and pigments, Filter cakes, Plastics (polymer granules), Building materials. Market: Mainstream chemical products, Pharmaceutical manufacturers, Fine chemical producers, Food/drinks industry, General chemical laboratories, Building materials producers. Vacuum System: Inlet Condenser , Catch Pot(Knock-Out Pot), Inlet Isolation Valve, Outlet Condenser, Stainless Steel Piping. Application: Transformer and switchgear oils, hydrocarbon oil, Turbine lubrication and seal oils, Brake fluids,, Phosphate esters and other hydraulic oils, Synthetic fluids, Silicone oils, Fluorocarbon oils, Resins, Paints and polymers, Glues and adhesives,Pastes, Water for medical, food and boiler uses. 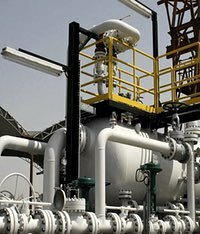 Oil refining and supply companies, Hydraulic control and equipment manufacturers, Automotive and allied industries, Aircraft and aviation industry, Chemical and allied industries. 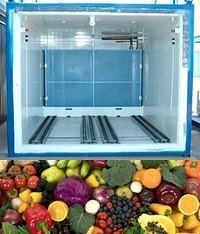 Application: Rapid evaporative cooling of: market garden products, water and high water content liquids, cooked, baked or high temperature processed foods, distributed dairy products, picked fruits. Market: Dairies, Food processors, Breweries, Fruit and vegetable importers/exporters, Market gardens, Agricultural institutions. Application: Ethanol , Isopropanol, Higher alcohols, Ketones, Aldehydes, Esters. 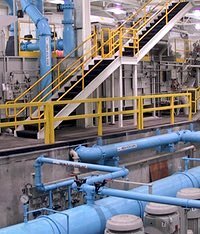 Pervaporation is primarily used for removing water from a range of aqueous organic liquids. 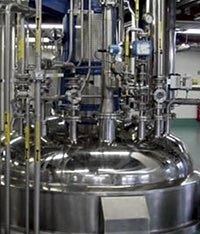 Market: Pervaporation Plant Manufacturers, Pharmaceuticals, Biotechnology, Chemicals, Solvent Recovery. Vacuum System: Inlet Condenser , Catch Pot(Knock-Out Pot),Inlet Isolation Valve, Outlet Condenser,Stainless Steel Piping. Market: Mainstream chemical producers, Food/drink industry, Pharmaceutical manufacturers, Fine chemical producers, General chemical laboratories/universities. Market: Pharmaceutical companies, Hospitals, laboratories, universities, museums, Fine chemical producers, Food manufacturers, Veterinary institutions. Vacuum System:Inlet Isolation Valve, Outlet Condenser,Stainless Steel Piping. Proofing and treatment of bulk textiles, Proofing of wood, fiber boards, concrete/fiber panels, Sealing of castings, especially aluminum castings, Lubrication of sintered bearing surfaces, Fumigation/sterilization of vegetables, fruits, feathers and fibrous fillings. Food importers, Foundries and OEM, Textile and home furnishing industry. Vacuum System:Inlet Condenser , Catch Pot(Knock-Out Pot),Inlet Isolation Valve, Outlet Condenser, Stainless Steel Piping. Chlorobenzene, Chloroethane, Cyclohexane, Dichloroethane, Dichloromethane, Trichloroethane, Trichloroethylene, Ethyl Tert-Butyl Ether, Methyl Tert-Butyl Ether, Ethyl Acetate, Methylene Chloride, Perchloroethylene, Methyl Ethyl Ketone, Ethybenzene. Market: Refineries, Petrochemical factories, Oil terminals, Marine terminals, Storage tank vents, Process vents, Truck loading racks, Railcar loading facilities, VRU manufacturers. Vacuum System:Inlet Isolation Valve, Liquid Injection, Absorber Column. Typical VRU Condition: Operating Temperature 80 °C or less – Operating Pressure 33 mbar ~ Atm. 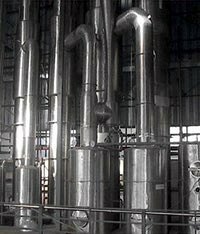 Application: Vacuum degassing (VD), Vacuum oxygen decarburization (VOD), Vacuum degassing oxygen blowing (VDOB), Vacuum carbon decarburization (VCD), Ruhrstahl-Heraeus (RH), Vacuum induction melting (VIM), Vacuum induction degassing (VID). 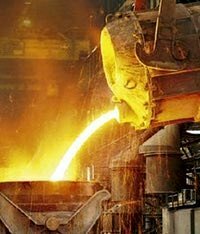 Market: Electric steelmaking, Oxygen steelmaking, Ironmaking and steelmaking. Vacuum System:Inlet Filter, Vacuum Booster, Cooler, Inlet Isolation Valve, Purge Valve, Stainless Steel Piping. 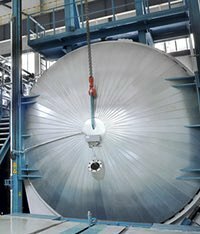 Typical Steel Degassing Condition: Operating Temperature 40-70 °C – Operating Pressure 0,67 mbar ~ Atm. Application: Homogenisation, Stress relieving, Normalising, Hardening, Tempering, Sintering, Annealing, Brazing, Carburizing, Melting, Out-gassing. 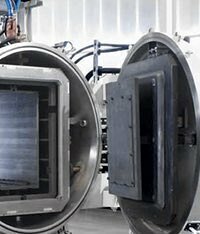 Market: Vacuum Furnace manufacturers, Vacuum Furnace Plants, Laboratories, Research institutes. Typical Vacuum Furnace Condition: Operating Pressure 0,001 mbar ~ Atm. CF - P.Iva IT01785670157 - C.C.I.A.A. Milano 872267 - Cap spc. Euro 98.800 I.V. I consent to Bgs General Srl - Pompe per vuoto - Vacuum Technology collecting my details through this form.